Still only in his 20s, Mikko Franck has rapidly established himself as one of the most exciting international conductors, with a wide ranging repertoire for both the concert hall and the opera house. He first established his credentials with many of Finland's orchestras and now regularly conducts some of the world's greatest orchestras. Mikko Franck began to play the violin at the age of five and entered Helsinki's Sibelius Academy in 1992, subsequently studying in New York, Israel and Sweden. It was in 1995 that he began conducting studies; at first privately with Jorma Panula, then between 1996 and 1997 within the conducting class of the Sibelius Academy. In 2007, Mikko Franck assumed the post of General Music Director of the Finnish National Opera. Between 2002 and 2007, he was Music Director and Chief Conductor of the Orchestre National de Belgique. 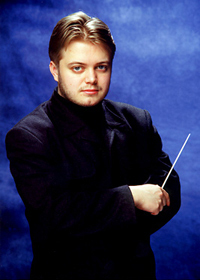 In recent seasons, Mikko Franck has worked with orchestras such as the Berlin Philharmonic, Munich Philharmonic, Bamberg Symphony, Finnish Radio Symphony, New York Philharmonic, San Francisco, Chicago, Tokyo and London Symphonies, Philharmonia, Israel Philharmonic, the Chamber Orchestra of Europe and Mahler Chamber Orchestra. He has toured Japan with both the Bamberger Symphoniker and the Orchestre National de Belgique, and in May 2002 was Artistic Director of a Rautavaara Festival with the Helsinki Philharmonic. At the Finnish National Opera, productions Mikko Franck has conducted have included Parsifal, The Magic Flute, L'Elisir d'Amore, Don Giovanni, La Bohème, Puccini's Manon Lescaut, Mussorgsky's Khovanschina and, in Autumn 2003, the world première of Einojuhani Rautavaara's opera Rasputin (recorded on Ondine, ODV 4003). The 2006-07 Season includes productions of Tosca, Eugene Onegin and Sallinen's opera The Red Line. Outside Finland, Mikko Franck has conducted Carmen at the Royal Stockholm Opera, and, in Spring 2004, L'Elisir d'Amore at Staatsoper Berlin. In the 2006-07 season he conducts a revival of Tosca at the Royal Opera House, Covent Garden. Mikko Franck's recording of Sibelius's En Saga and Lemminkainen Legends with the Swedish Radio Symphony (ODE 953-2) received outstanding reviews throughout the international press; the disc won the Diapason d'Or Award and was also nominated for a Grammy Award (Best Orchestral Performance) in 2001. Other discs include Tchaikovsky's Sixth Symphony "Pathéthique" (2003; ODE 1002-2) and Rautavaara's opera House of the Sun (2003; ODE 1032-2D). Among Mikko Franck's latest releases is a disc of works by Rautavaara with the Orchestre National de Belgique (ODE 1064-5). Also released recently was the book Conversations and Writings, co-written by Mikko Franck and Einojuhani Rautavaara and published by WSOY in May 2006.